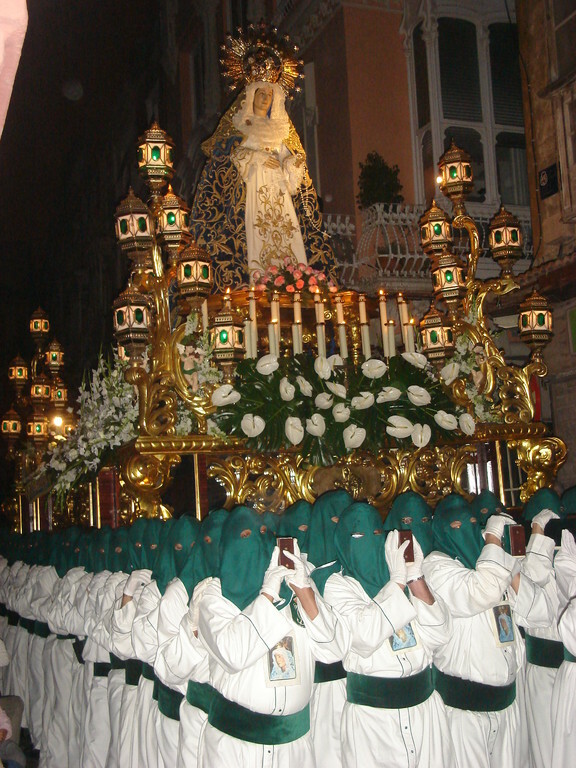 Or that's what it seemed like, this 10 day marathon of processions, and we've seen nearly all of them. 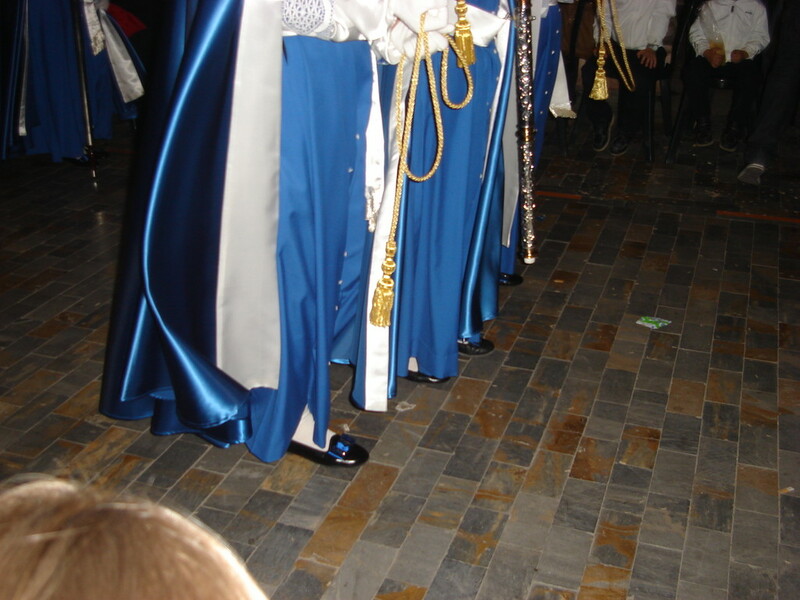 The first procession was at 4 o'clock in the morning! and so we skipped that one. But we went to view most of the others and all the hours of waiting and standing were really worth it. The processions all started off with a few policemen clearing the road of vendors of balloons, sweets and pipa's (sunflower seeds, the eating of which seems to be a national pastime, as well as leaving the shells where you drop them). 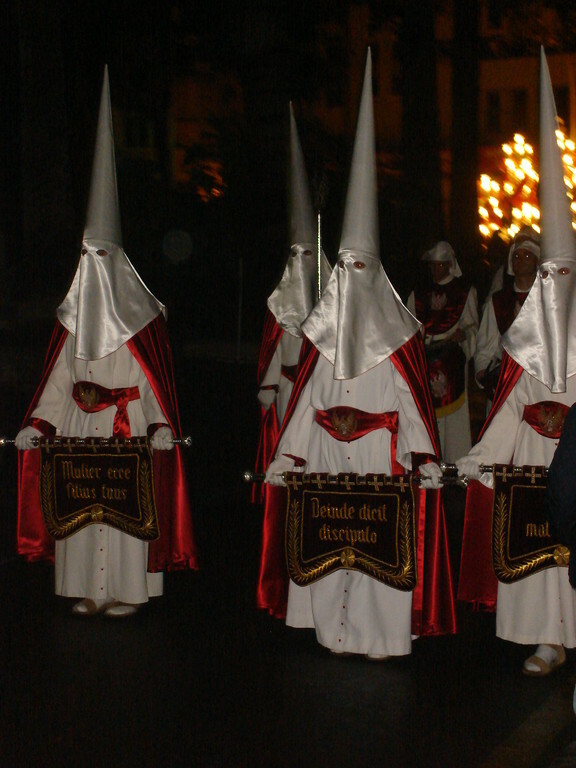 Every procession had several groups with their own theme and their own colours. 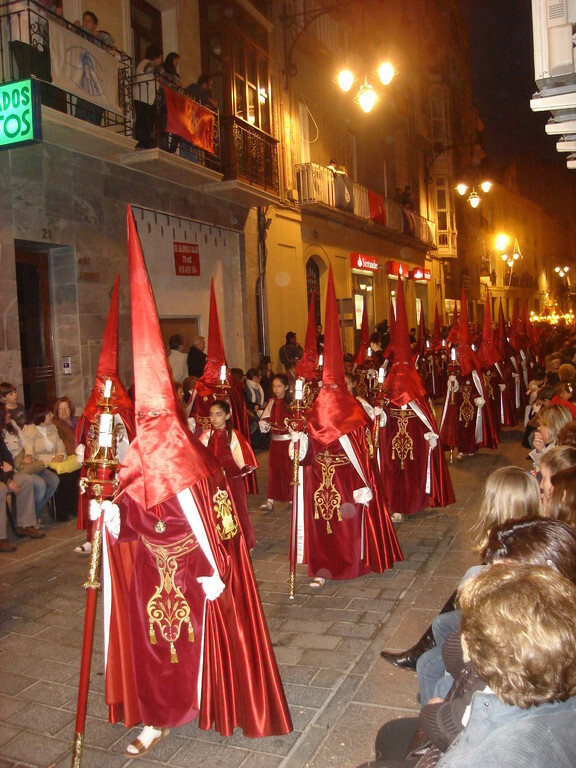 Each group consisting first of some drummers doing a slow monotonous beat, three people bearing a magnificently embroidered standard, followed by two long rows of people in beautifully coloured flowing cloaks, carrying banners, horns, staffs or candles, their heads covered in high pointed hats with veils that only have small holes to see through. A bit sinister it seemed at first, like the Ku Klux Clan, but together with their very precise walking and stopping in time to the drumbeats it made for a special atmosphere. 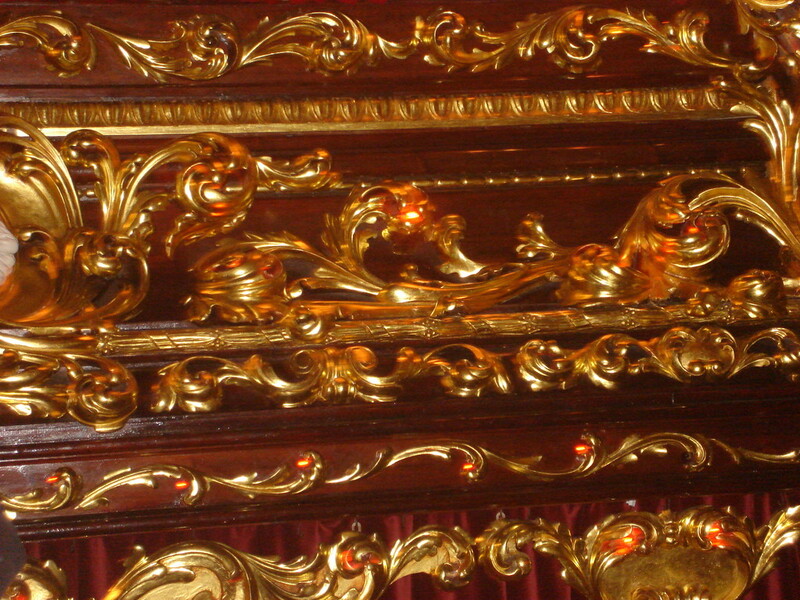 Then there were some children swinging insence, a music band and of course a trono, the throne or float, some driven mechanically, others carried by some hundred people, stopping every 30 metres or so, and all eleborately decorated with carvings, flowers and of course a statue. As the week went on, the thrones got bigger and bigger. 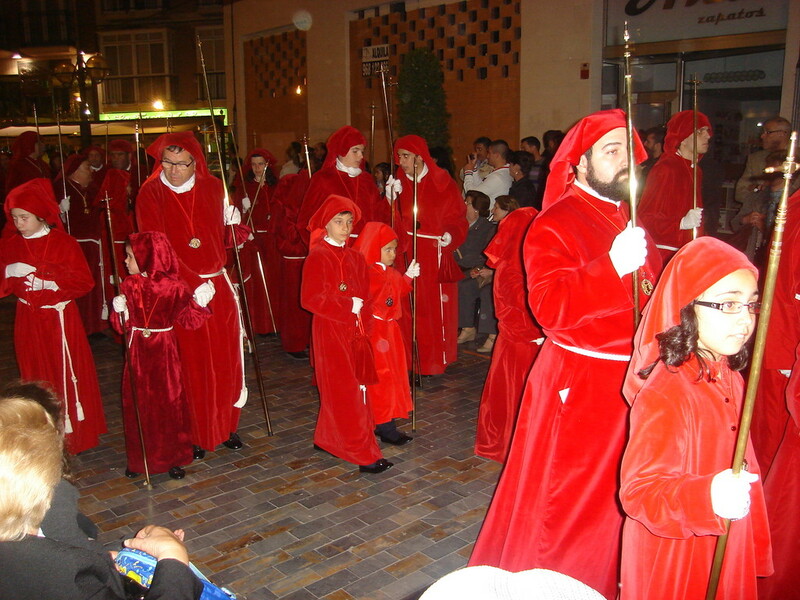 And between there were groups of so called penitents, every cofradía (the organising brotherhoods) in their own colours, the children handing out sweets to the children spectators and the adults handing out pictures. 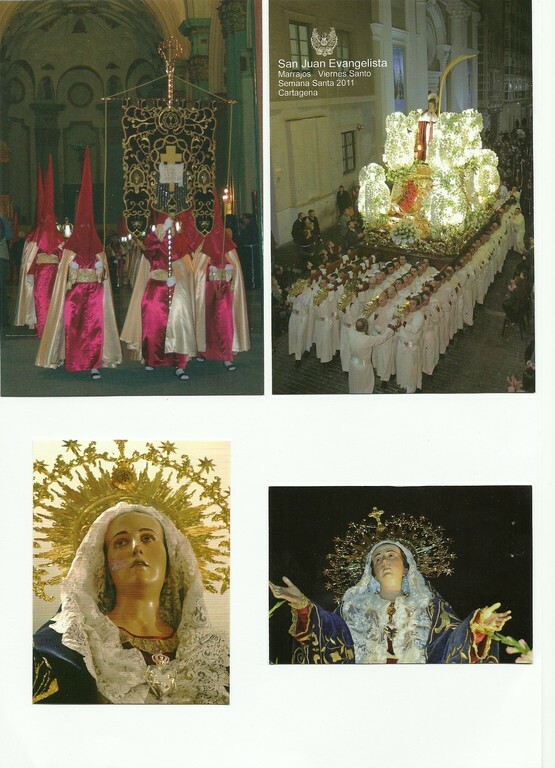 Some processions also had groups of Romans, or women with mantillas. All processions ended with a precisely marching military group, to show off Cartagena's naval military tradition. 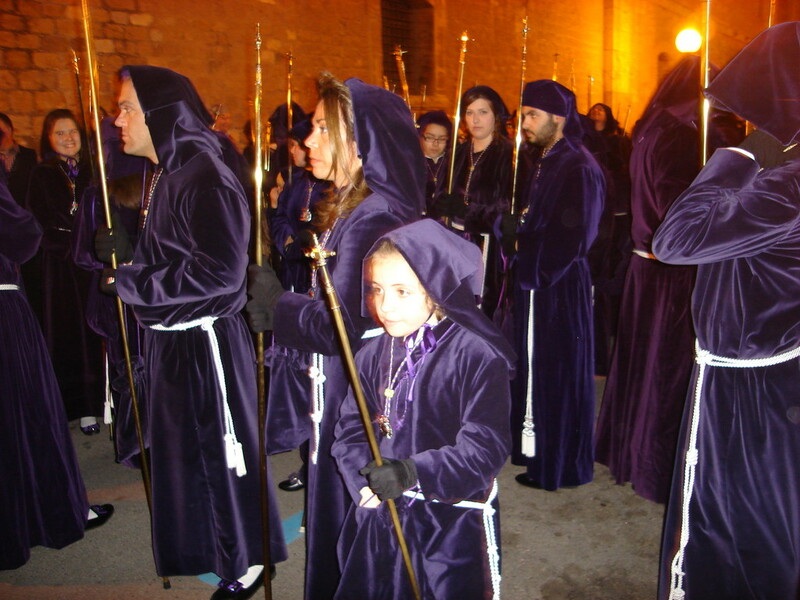 The several processions sometimes seemed much of the same, but every day had its different holy theme and as we got to recognize participants we realized they were wearing different robes every day. So the total amount of clothes must be tremendous. It's probably full of symbols of which the meaning totally escaped us, but one doesn't need to be religious to impressed by it all. 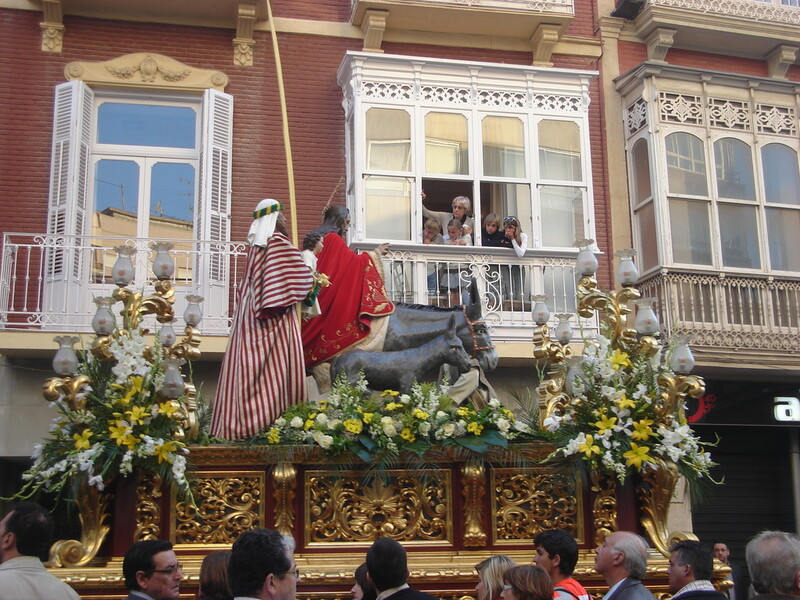 Especially in the narrow streets, where the procession goes past at arms' length, it's all very fascinating. 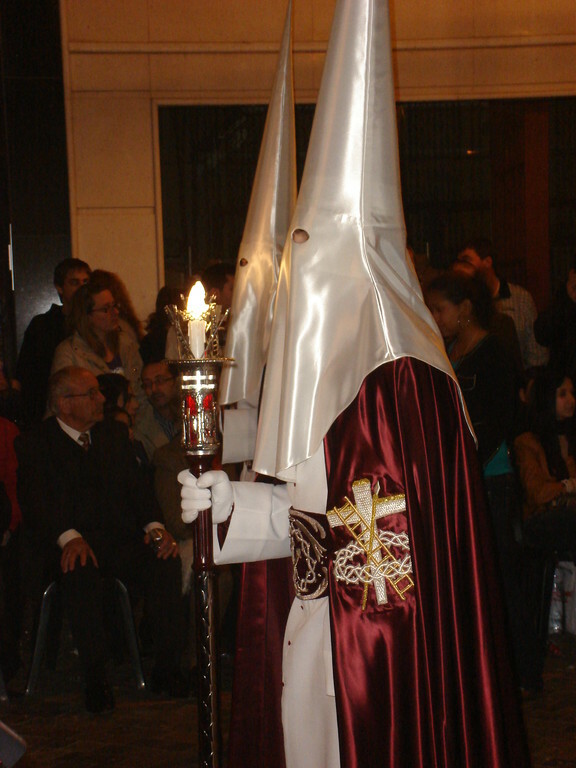 Also during the silent procession on Maundy Thursday, when all the lights were off (except for the camera flashes of course), everyone in the procession was veiled, no music was being played, but for a drummer at the start and at the end. Then the public just went all silent and only the sound of the footsteps and the staffs were heard – and the munching of pipa's. 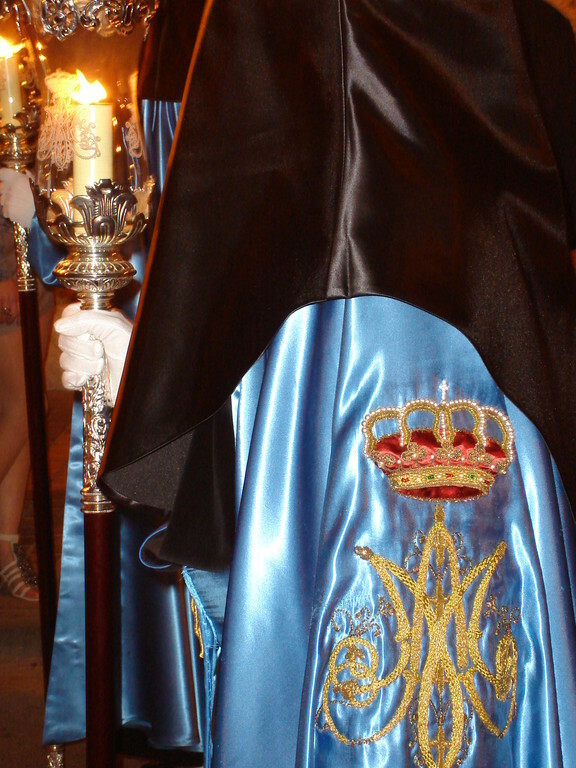 And the Friday morning was something special when we got up early to see the 5 a.m. procession. We were also very impressed by the Spanish people, how patient they sit and stand around waiting, no pushing at all, no complaining about things starting late, no disturbance by groups of teenagers, hardly any police around; in fact all very civilised. 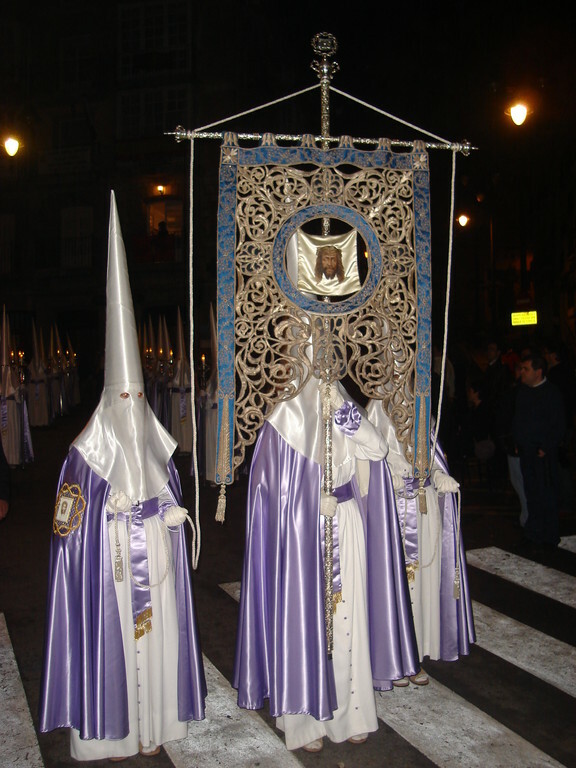 Even on the Easter Sunday, the day of the biggest procession, there was no grumbling when due to the rain (that even stopped after a while) the program was cancelled and only the two biggest thrones were taken out for just a few minutes. We were quite amazed: all these people having done all these preparations for weeks or months, and all just for nothing because of some rain. We had seen the same happening in Galicia, where they should be used to a bit of rain, but there as well people just never complained, neither the procession walkers nor the spectators. Don't think all the participants are very pious; when during the Wednesday procession Real Madrid was playing Barcelona, many of them were very eager to hear the score and we saw one of the throne bearers with a radio earphone. Nor is all of the public very devout; we noticed a lady keeping her little boy from fidgeting by showing him a bull fight on her video camera. 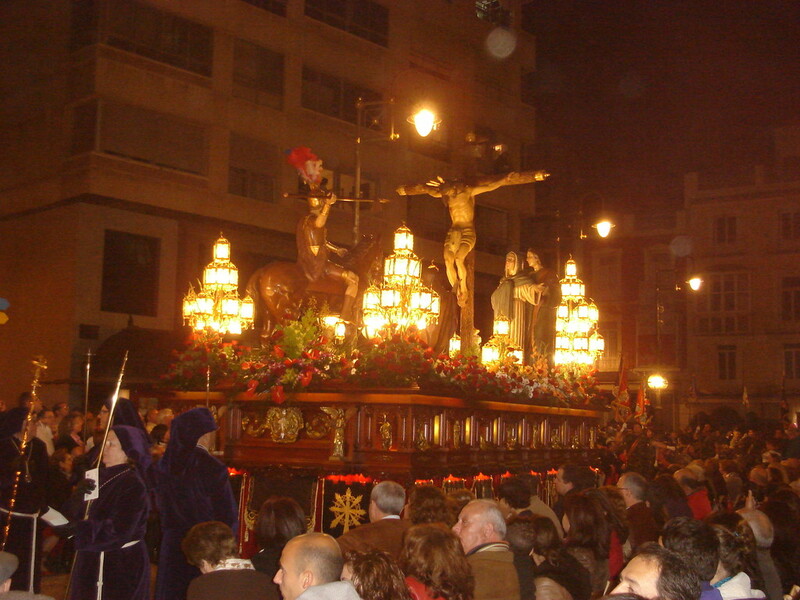 Semana Santa has been a great semana, but has interfered a bit with all our jobs to get the boat ready for sailing. And just now we heard next semana will be the Semana de la Guitarra with concerts every evening.... Anyway, the weather isn't nice enough yet for sailing, so we're not stressing ourselves in getting Eos shipshape.